Monday morning, March 5th, the Deland Shuffleboard Club hosted the season ending InterCity (Deland, Orange City, Ormond Beach, New Smyrna Beach) Tournament. Two Groups of shufflers, A (above .500) and B (below .500), were established depending on how many matches were either won or lost by the InterCity participants during the November 2017 to March 2018 season. Candy Kordeleski won the 50/50 drawing. Christine Giumarra lead us in a prayer followed by the Pledge of Allegiance. Twelve (12) teams made up Group A and Fourteen (14) teams made up Group B. We drew chips to see which court and team each participant would compete against. Each participating team played five matches of 16 frames. The winners recorded their score and court number. After each match we drew new courts and opponents. After we all played three matches, we broke for a fine lunch of pulled pork (prepared by Richie and Carolyn Burrell), potato salad, coleslaw, chips and drinks. Following lunch, we all played our last two matches, cleaned the courts and went in for cookies and ice cream. Director Richie Burrell tallied up all the scores and thanked all the people who helped out making this program a success. The CMS Club would also like to thank Carolyn & Richie Burrell, Barbar Allen, Jim Applebee (for all his hard work with the disc prep), Mary Ann Pabst, John & Christine Giumarra, Keith & Irene Wheeler, Rod & Donna Lewis, Jerry & Barbara Barr for all their support and hard work during this tournament/banquet. Congratulations to all the shufflers participating and Placing. 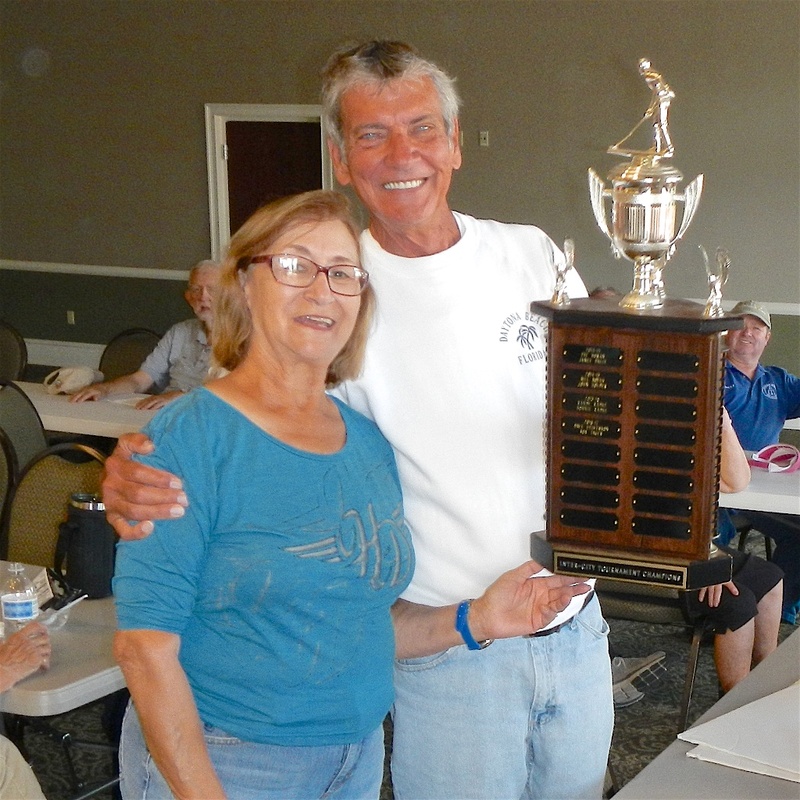 A Team Winners – First Place Christine & John Giumarra (TROPHY); Second Place Bob Tager & Guy Godman (CMS); Third Place Bonnie & Randy Radke (CMS); Fourth Place Bill Boyes and Sid Pomainville (CMS). 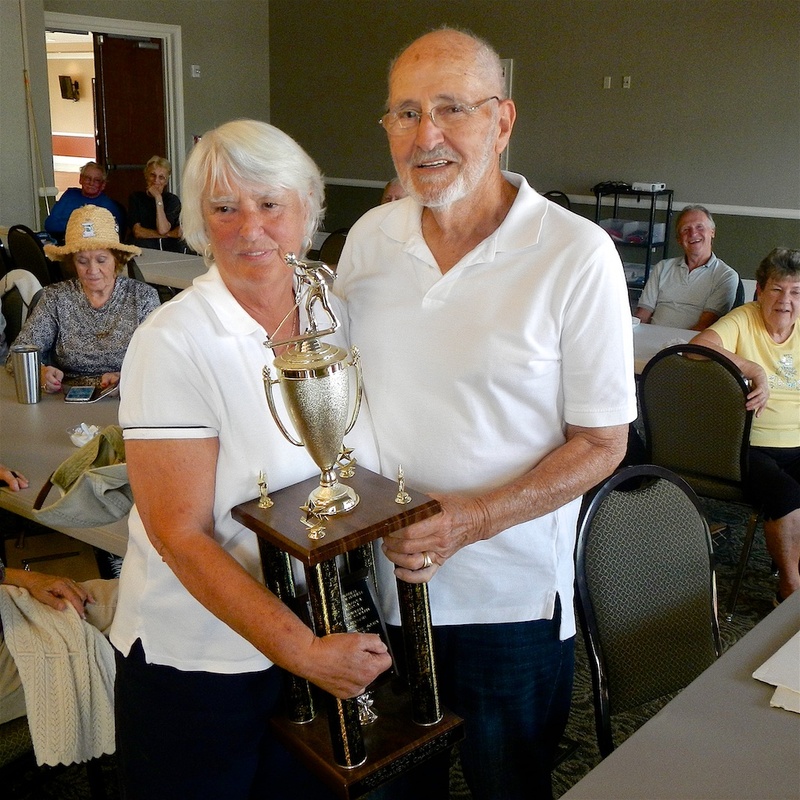 B Team Winners – First Place Rose Sargent and Dennis Buelk (TROPHY, CMS); Second Place Jane and Mike Ingoglia; Third Place Bryant (Pete) Peterson and Charlie Jones (CMS); and Fourth Place Barbara and Jerry Barr. The First Place winners from Group A and B will have their names added to their two respective InterCity Trophies. Trophies will be kept on display at each winner’s clubhouse. Ciao! More Pictures For the InterCity Tournament.